Major U.S. indices are down slightly on Monday, as investors still mull over the development of a potential slowing global economy. That’s left some stocks to do well on the day and others to drag their feet. Let’s look at our top stock trades for Tuesday. Let’s look at the big name of the day, and that’s Apple (NASDAQ:AAPL) with its slew of Services announcements. 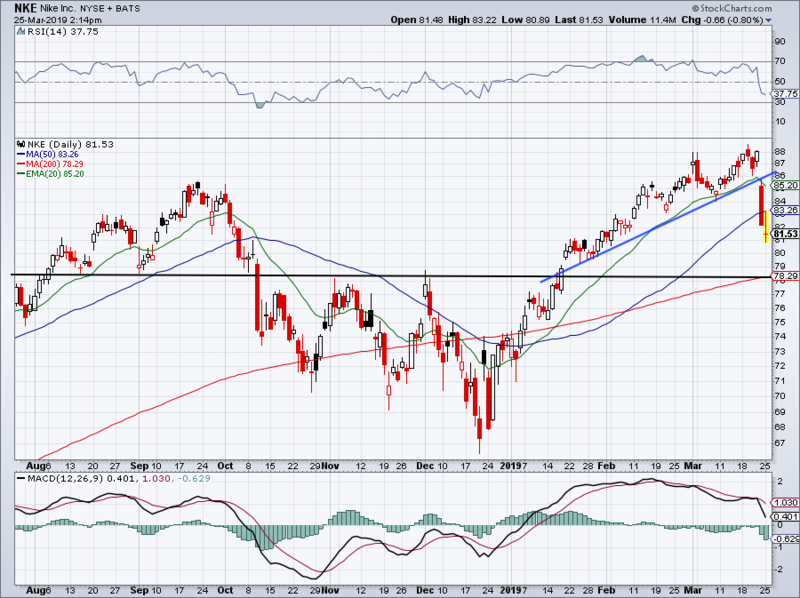 $195 is now acting as a roadblock to Apple stock and the 200-day moving average isn’t holding up as support. The name could remain volatile over the next session or two following this announcement, but for now it looks like shares are set to pullback. That’s important, as it helps unwind the overbought condition that Apple has been carrying for the last week or so. So what now? Look to see if $185 — the prior gap level from November — holds as support. Just below, near $182 is the 20-day moving average and uptrend support (blue line). 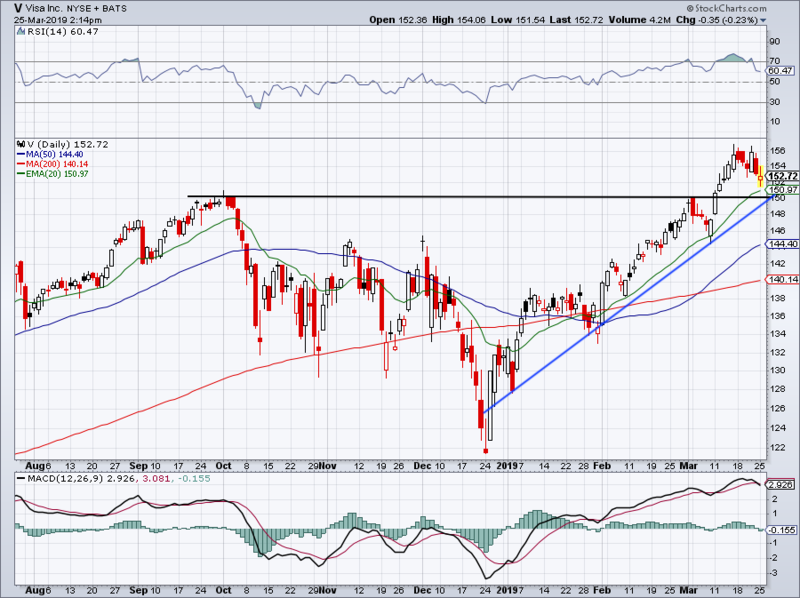 Below these levels and the $175 mark is on the table, where Apple posted its big breakout from earlier this month. At one point, Roku (NASDAQ:ROKU) was up more than 6% on Monday while its CEO was at the Apple event. Shares have since cooled somewhat, but are still up 4% on the day after Apple said its Apple TV app would work with Roku. The stock is well off its session highs, but is still holding up over the 20-day moving average. That’s important for bulls, particularly as the overall market remains under pressure. 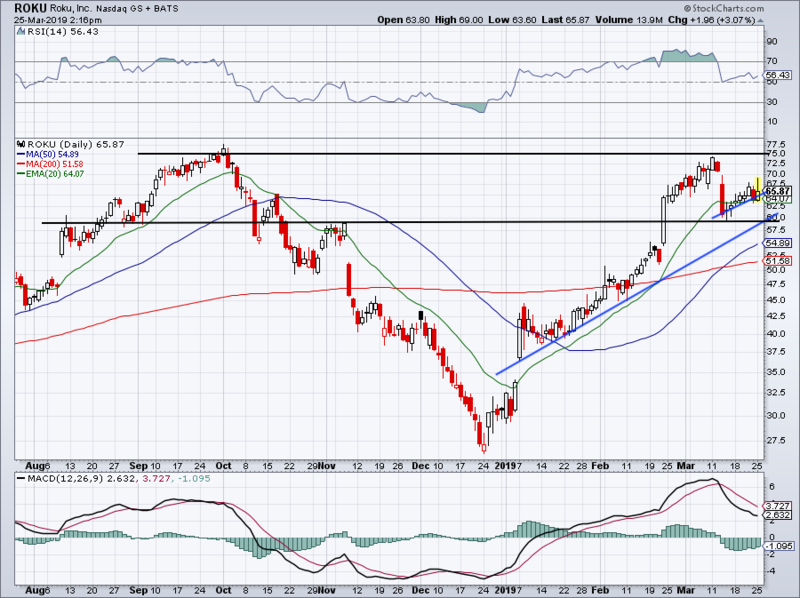 However, momentum is susceptible to fading here and if it does, we could see ROKU stock back near $60. If that’s the case, see how this level holds up as support. 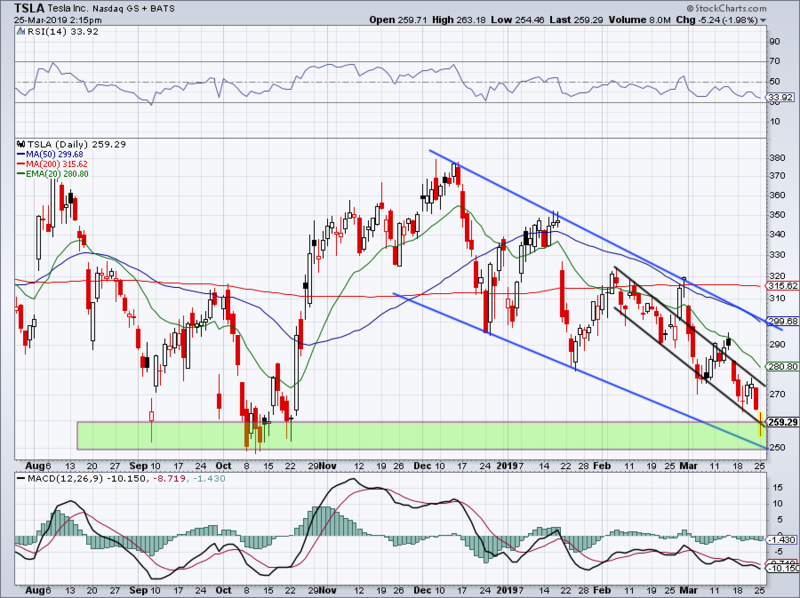 Should shares continue higher, see if they can fill the gap back up to $71. If it can, Roku may test its all-time highs. A big downgrade from RBC sunk shares of Tesla (NASDAQ:TSLA) on Monday, as the downward pressure continues. However, the stock is finally down in that buyers’ support zone we’ve talked about before. Down into this $250 to $260 zone, investors can take a limit-risk shot on the long side knowing that a close below this area would be their exit. On a rally, investors can use three upside targets: short-term downtrend resistance (black line), the 20-day moving average and medium-term downtrend resistance (blue line)/the 50-day moving average. We recently covered Nike (NYSE:NKE) thanks to earnings, but the company’s name is back in the news on Monday after lawyer Michael Avenatti was arrested on extortion attempts against the athletic apparel maker. Shares rallied higher on Monday but failed at the 50-day moving average before turning lower. Given that this level failed to buoy Nike meant the 200-day moving average was on the table. Let’s see if we can get a pullback into this $78 to $80 area and if so, we can take a calculated shot on the long side. Visa (NYSE:V) is also a name we’ve liked on the long side, and we’re finally getting the setup that we like. After pushing through $150 and stalling at $155, V stock is starting to pullback. Aggressive bulls can initiate a position, preferably near $152, with a limited-risk setup. Below $150 and V will lose the 20-day moving average, breakout support (black line) and uptrend support (blue line). 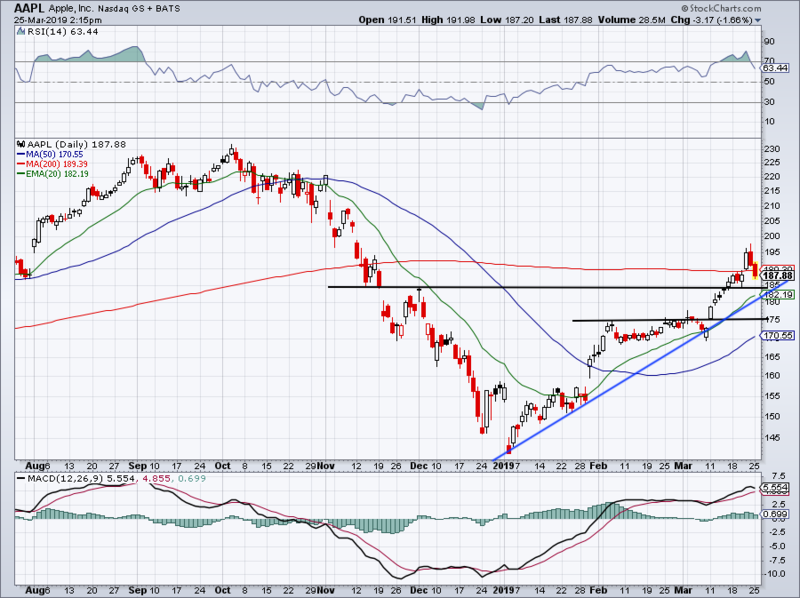 Should it hold, look for $155 or higher, although Visa may need the broader market’s cooperation. Bret Kenwell is the manager and author of Future Blue Chips and is on Twitter @BretKenwell. As of this writing, Bret Kenwell is long AAPL, ROKU and V.